We say goodbye to Gerald "Jerry" Miller who retired this past spring. 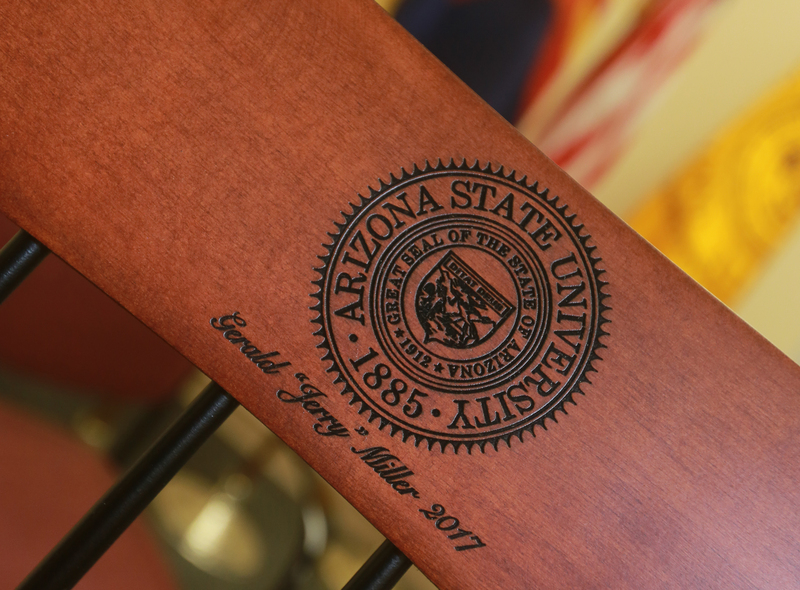 Thank you for contributions to SPA, the College of Public Service & Community Solutions and ASU. Congratulation to Dr. Chul Hyun Park! Dr. Park received his Ph.D. in public administration and policy (2016) and has accepted a tenure-track position with the Clinton School of Public Service, University of Arkansas. Professor Siegel joins the Public Affairs Faculty and will serve as School Director. From 2008-2016, he served as Dean of the School of Business at the University at Albany, SUNY. He received his bachelor’s degree in economics and his master’s and doctoral degrees in business economics from Columbia University. He then served as a Sloan Foundation post-doctoral fellow at the National Bureau of Economic Research. Don has also taught at SUNY-Stony Brook, the University of Nottingham, RPI, where was he was Chair of the Economics Department, and the University of California-Riverside, where he served as Associate Dean for Graduate Studies. Dr. Siegel is an editor of the Journal of Management Studies, and the Journal of Technology Transfer, a former co-editor of Academy of Management Perspectives, an associate editor of the Journal of Productivity Analysis, a former associate editor of the Journal of Business Venturing and Academy of Management Learning and Education, and serves on the editorial boards of Academy of Management Perspectives, Academy of Management Review, Academy of Management Learning & Education, Journal of Business Venturing, Corporate Governance: An International Review, Strategic Entrepreneurship Journal, and the British Journal of Management. He has also co-edited 46 special issues of leading journals in economics and management. In 2016, he was elected a Fellow of the Academy of Management. Don has published 112 journal articles, 21 book chapters, and 12 books on issues relating to university technology transfer and entrepreneurship, the effects of corporate governance on performance, productivity analysis, the economic effects of gambling, and corporate and environmental social responsibility in such leading journals as the American Economic Review, Economic Journal, The Review of Economics and Statistics, Journal of Law and Economics, Journal of Financial Economics, Brookings Papers on Economic Activity, American Journal of Agricultural Economics, Research Policy, Academy of Management Review, Academy of Management Journal, Academy of Management Perspectives, Academy of Management Learning & Education, Strategic Management Journal, Journal of Business Venturing, Journal of International Business Studies, Journal of Management Studies, and Journal of Management. His most recent books are Innovation, Entrepreneurship, and Technological Change, the Oxford Handbook of Corporate Governance, the Oxford Handbook of Corporate Social Responsibility, and the Oxford Handbook of the Economics of Gambling, all published by Oxford University Press, and the Chicago Handbook of University Technology Transfer and Academic Entrepreneurship (University of Chicago Press). His citation count, according to Google Scholar, is 31,872, with an h-index of 67. Sean graduated from Mountain Pointe High School in 2002. Sean then went on to ASU, receiving degrees in Political Science and History. Professor Oliver joins us after a distinguished career in public service. He has served as an Assistant Chief of Police in his hometown of Phoenix, Arizona, the Director of Drug Policy in Memphis, Tennessee, Chief of Police in Pasadena, California, Richmond, Virginia, and Detroit, Michigan, our nation’s seventh largest police department. Additionally, Jerry served as the Special Policy Advisor for Matters of Public Safety to the Arizona Attorney General Terry Goddard and as the Deputy Director of the Arizona State Department of Administration. Then in December 2006, Governor Napolitano appointed Jerry to the Director of the Department of Liquor License and Control. He presently is the principal in Ruckus Struckinson Consulting LLC and serves as the Policy Advisor to the Center for Alcohol Policy in Alexandria, Va.